Friday’s TV is basically Agents of Shield (C4) or Atlantis (bbc3)…. 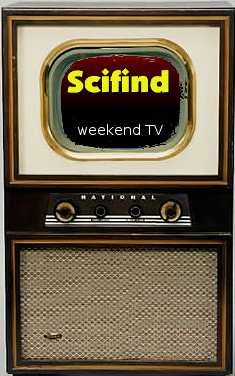 I’m suspecting that as far as science fiction is concerned, TV land has thrown in the towel on fridays. Although if you are staying up super late, you’ll find The Vampire Diaries on ITV2 at 1.25am. Saturday goes a long way to make up for this. Mr Magorium’s Wonder Emporium (2007) brings us Natalie Portman and Dustin Hoffman on CITV, but at 9.25am. We then get Star Wars (retitled Star Wars: Episode IV – A New Hope. (1977)) on ITV1 at 3.15pm, with ITV2 showing The Borrowers (1997) at 5.40pm followed at 7.30pm by Dragonheart (1996) – in which the dragon is voiced by Sean Connery. The evenings scifi offering is Predators(2010) at 9pm on Channel 4 – inevitable, but OK sequel with Adrien Brody, Topher Grace, Alice Braga, Danny Trejo and Laurence Fishburne; marooned on the alien planet as prey in a big game hunt. The Golden Compass (2007 – known to us as Philip Pullman’s book Northern Lights) is worth a look on Sunday – 4pm on Channel 4; later sees an offering from E4: 8pm, The Day the Earth Stood Still (2008) a remake of the earlier 1951 classic; but the performances from Keanu Reeves and Kathy Bates do make it worth seeing. But for sheer exuberance and fun, and a host of those famous and not so famous then or since (inc. former chief scout Peter Duncan, and the voice and the body that is Brian Blessed!) I’m going to suggest sofa, duvet and popcorn are utilised at 3.45pm where ITV4 are showing Flash Gordon (1980).